I got the idea for this recipe from a Burger Blog . Last weekend I went to a friend's goodbye party and met Mike who has his very own blog all about different burgers. He rates burgers at restaurants on quality, value and complexity. He also makes his own burgers. I saw he posted a recipe for a 'Serious Chicken Burger' and thought I'd give it a try. I ended up making my own variation, but the principle is the same. Grinding the chicken yourself rather than using already ground chicken is key. They are much more moist and the texture is much improved. Pulse chicken in food processor about 20 times. Add in Onion and blend some more. Crack egg and mix in, and add in salt and pepper. Form into patties. Grill or fry in frying pan about 7 minutes per side. Disclaimer: Be careful to wash hands thoroughly when handling raw chicken. Also be sure the burgers are cooked through. I served these burgers on whole wheat thin buns with avocado ( as you can see mine wasn't quite ripe enough yet), feta cheese, and spicy mayo ( light mayo blended with banana peppers). Mike recommends buffalo mozzarella and chimichurri sauce ( I have yet to try making it, bought I bought parsley and hope to try it out soon). You can have fun experimenting with different toppings. 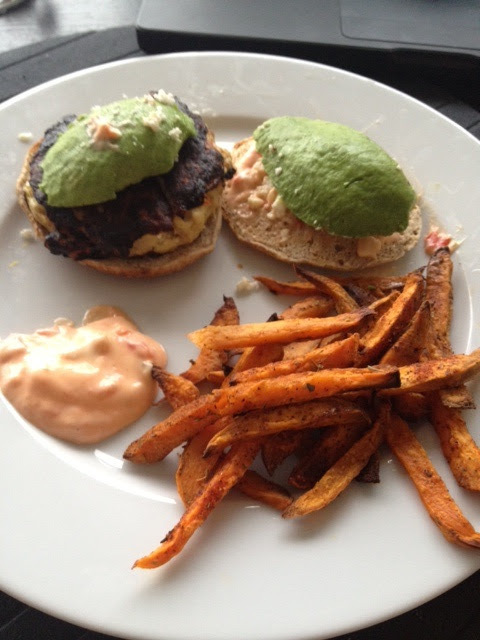 I accompanied the burgers with sweet potato fries. It was a great combination.